Whether they’re authentic or not, videos of Islamic State militants destroying ancient artifacts at Iraq’s Mosul Museum and elsewhere are “propaganda videos” meant as “heritage terror,” an Islamic art professor told RT. 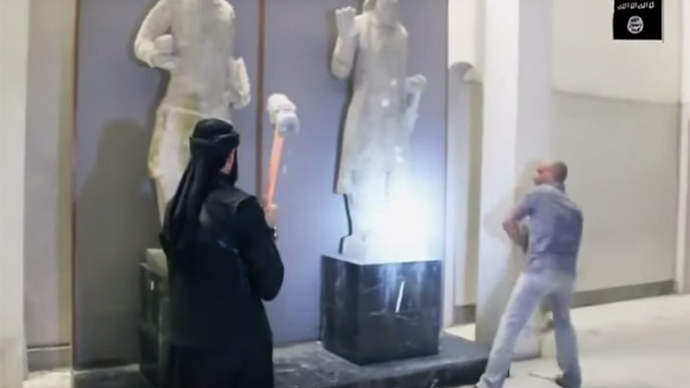 The videos show men with sledgehammers knocking over statues, smashing antiquities and torching ancient writing. But there are questions being raised about the authenticity of the videos, when it’s known that the Islamic State (IS, formerly known as ISIS/ISIL) needs money to keep operating its terror campaign – and antiquities could fetch large sums of money on the black market. Speaking to RT’s Manila Chan, Dr. Stephennie Mulder, an associate professor of Islamic Art at the University of Texas at Austin, said the Islamic State’s destruction of ancient artifacts in Iraq and Syria is an act of propaganda. Mulder was an archaeologist in Syria for over a decade before joining the faculty at the University of Texas at Austin. The theft and destruction of antiquities was described by the UN as erasing the history of humanity, and Mesopotamia is described by many as the beginning of civilization. Mulder said Syria is home to six World Heritage sites and five have already been severely damaged. When asked about the authenticity of the videos, and whether the statues allegedly destroyed at the Mosul Museum were actually ancient since metal rods are seen, Mulder said the rods signify nothing. Mulder said ISIS is getting a lot of attention for the destruction, but they are not the only ones behaving like this. She said soldiers from the regime of Syrian President Bashar Assad were caught on film looting objects from Daraa in southern Syria. She added there was evidence early on in the war that some Free Syrian Army fighters were looting from archaeological sites for profit, but they have since made strong gestures to join the international community in preserving the sites.